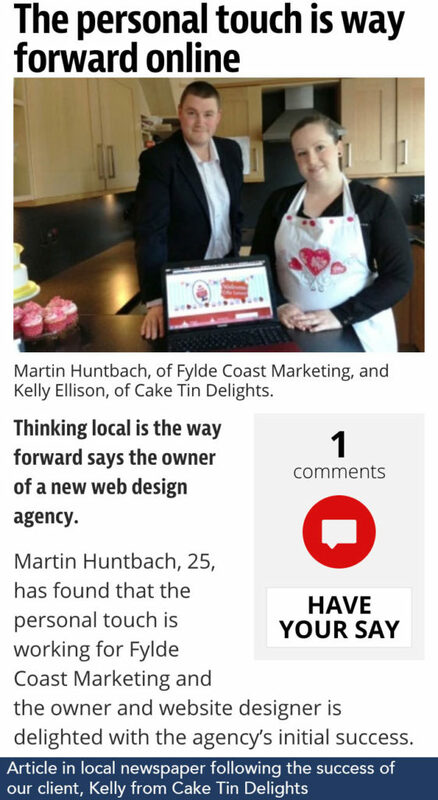 Fylde Coast Marketing specialises in website design, search engine optimisation, PPC (pay per click) management, social media management and copywriting for businesses, charities and the public sector. We’re based in lovely little town called Cleveleys, near Blackpool. But don’t let our size fool you! We’ve worked with businesses all across the world, from Australia to the United States, Canada to Switzerland. To get to know the full team, just click here! Web designers and search engine specialists have a reputation of being hermit type creatures. In fact, there’s nothing we love more than chatting to our clients face-to-face, via Skype, or by phone in order to get a full understanding of your business. You see, we don’t just want to create you a website or get you to the tippy-top of Google results; we want your online business to thrive. And the only way we can that is for us to understand your business, what you want from it, what your current issues are and how we can work together to solve them. But don’t worry, we don’t insist on a meeting! Just let us know your preferred method of communication and we’ll work around you. It all started with a cushion. Well, one hundred and forty-eight cushions to be precise. In 2010, my wife, Lyndsay, and I decided to embark on an exciting journey. We decided to set up shop online, where we would sell (yep, you guessed it!) cushions. They were beautiful products, in an array of colours and materials. They were reasonably priced, ethically sourced, so what could possibly go wrong? Well, the answer is: a lot. We spent thousands on a brand new website. I already had a strong background in graphic design, so I spent hours and hours creating all the images for the products. Lyndsay used her marketing brain to promote the site via social media and content marketing. The website went LIVE and we continued to hit the refresh button on our order page, hoping for a flurry of sales. But nothing happened. Time went by. And after sales to family and friends, we were left with one hundred and thirty two cushions, one website and zero online sales. I identified two issues, firstly, we were nowhere to be seen on Google and secondly, if people did find our website, we had trouble converting them into sales. I was extremely deflated that our online adventure wasn’t as profitable as I’d hoped. But something good came out of it. I took a course on website design and SEO, and I studied religiously for twelve months. After that, FCM was born! And over the years, we’ve helped countless businesses find success online. Five years later, we’re still going strong.